The First Echo: Melissa McCarthy as a Dowdy Writer in a Literary Crime Dramedy? Yes Please. Melissa McCarthy as a Dowdy Writer in a Literary Crime Dramedy? Yes Please. After we get the broad comedy of this summer's Life of the Party, we get to see star Melissa McCarthy in a role that award nominations are made of: a makeup-free, frumpy writer with first-world frustrations. 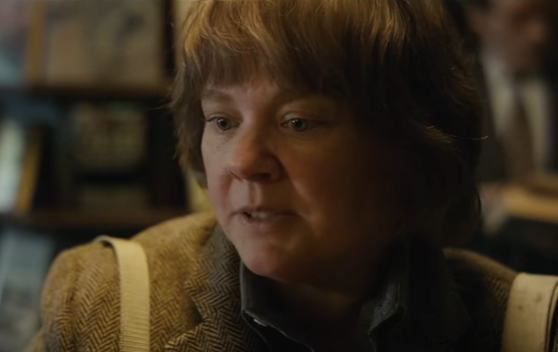 Introducing: Can You Ever Forgive Me? I'm not sure I can forgive the writer who decided on this title. The movie is about a washed-up celebrity biographer who resorts to fraud in order to reboot her fledgling career. As much as I would eat up a film like this ("based on a true story," no less), it seems more award-adjacent. Meaning, it doesn't quite seem like an award contender -- even though it has a few Oscar-baity elements attached to it. But it's only the beginning of April. Who knows how this'll turn out when Fox Searchlight releases it into a nominal amount of theaters this fall. And yes, I realize Jane Curtain is known for kicking off SNL back in the 70s and co-starring in the 90s hit comedy 3rd Rock From the Sun, but if you know me...well, you know me.